Twitter is one of the busiest social networking platforms on the internet today. With over 300 million users worldwide, it’s easy to see why brands tend to flock to this platform for their marketing efforts. Twitter is a place where people can get fast updates, away from the usual noise of social media. Because users need to adhere to the character limit, updates are jam-packed with information and are direct to the point. But you can’t succeed on social media if you don’t measure your campaign. Knowing which analytics tools to use can help you efficiently spend your marketing resources and energy on Twitter. Find out how you can supercharge your Twitter marketing campaign for 2018 by using the right tools below. Investing in the right tool today can help you develop a strategy that delivers results for present and future campaigns. You don’t have to look far to delve your hand into some data on Twitter. The platform’s native analytics tool gives you access to in-depth data sets that can help you better understand your campaign’s performance. The best thing about Twitter’s native analytics tool is it’s free. If you’re new to data tracking and Twitter marketing, the native analytics tool is the best place to start. 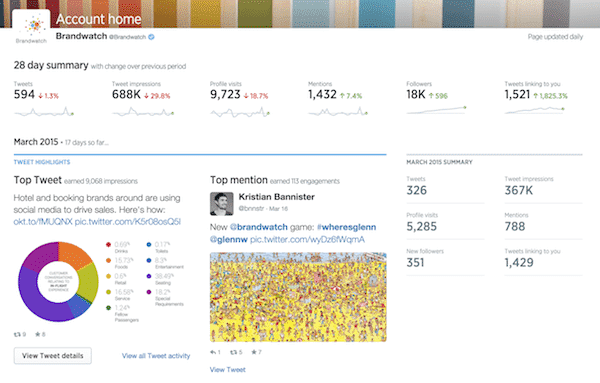 Compared to other analytics tools, Twitter’s data tracker is intuitive and less intimidating. You can easily monitor the performance of your post without having to jump through several tables and graphs at a time. You can also use Twitter analytics to conduct a comprehensive competitor analysis. Keeping yourself updated on how your competitors are using Twitter can help you develop a better strategy to get ahead. Twitter Analytics is designed to help you understand your audience and determine the best type of posts that resonates with them. It has features that allow you to measure account and individual tweet metrics to help steer the course of your campaign – both present and future. AgoraPulse is a social media management tool that packs a punch. You can use it to monitor several accounts at a time through their highly organized dashboard. Collaborating with your entire team for your campaign is made easy through AgoraPulse. If you have an upgraded subscription, you can invite collaborators into your dashboard so you can all work together on a certain campaign. AgoraPulse lets you manage several Twitter accounts at once, you can also customize the tabs that. This analytics and social media management tool is designed to help brands collaborate with team members more efficiently. If you want an analytics tool that gives you access to in-depth data without being overwhelming, you need to get your hands on AgoraPulse. To strengthen your Twitter marketing campaign, consider purchasing a few thousand Twitter Followers from a tried and tested provider. A few thousand Twitter Followers will help you impress organic users and broaden your reach. Almost every brand is on Twitter and the competition can be tough. Union Metrics is an analytics tool that’s designed to help you stay competitive. Union Metrics can help you build a comprehensive repository of historical and comparative data from other accounts that are similar to yours. Union Metrics is also the only analytics tool out there that has the ability to analyze Twitter conversations and break them down into scaleable data sets. You can also use Union Metrics to find relevant content that you can share based on what your target audience is sharing on their Twitter timeline. If you like crunching numbers and getting your hands dirty with data, Union Metrics is the right analytics tool for you – and your campaign! It’s one of the few analytics tools out there with real-time monitoring capabilities that lets you come up with an agile strategy for your Twitter marketing campaign. Union Metrics makes it so much easier to listen and capitalize on new Twitter conversations that are relevant to your industry as they unfold. It also has user-friendly campaign reporting features that help you draft and publish reports for your team in just a few easy clicks. HootSuite is known for their scheduling feature but what most don’t know is that it’s also a pretty rad analytics tool. HootSuite boasts a fully customizable stream that allows you to keep watch on your unique data requirements. With HootSuite’s customizable stream, you can easily review the type of data that is most important to you and your campaign. You can use HootSuite to monitor hashtag performance and keep track of all the tweets you were mentioned in all while maintaining a good overview of your growth and engagement. TweetStats is an analytics tool built to help you strengthen your engagement on Twitter. TweetStat tells you when the best times are to post based on your target audience’s browsing patterns. TweetStats also lets you monitor competitor accounts and track your best-performing tweets. It’s a pretty straightforward analytics tool that’s perfect for beginners. TweetStats uses easy-to-read graphs to help you better understand your tweet density and its relation to the engagement you’re receiving. If you want to track your tweet’s reach and overall performance by the hour, TweetStats is the tool for you. It’s designed to give you a comprehensive overview of how your tweets are doing and how far they’re reaching on a single dash. Track it, Track It Real Good! In order to make the most out of the marketing benefits Twitter has to offer, you’ll need to dig deep.. Tracking your tweet’s performance becomes a lot easier if you use the right analytics tools. There are plenty of tools out there and you need to test out a few to find the perfect one. Contrary to popular belief, analytics tools are not at all expensive – in fact, some of them have freemium packages that let you do a lot without spending a dime. You can also further strengthen your Twitter marketing campaign by purchasing an impressive number of Bought Followers from a tried and tested provider. If you want your Twitter marketing efforts to pay off, you need to start tracking – and track it real good!